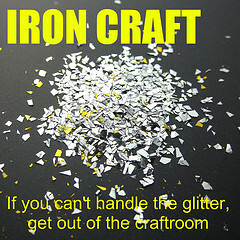 This week over at Iron Craft, the theme is camp crafts. I did several crafts this week. 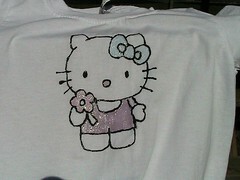 I found these color change paints at the store last week and knew I had do make my daughters t-shirts with them. 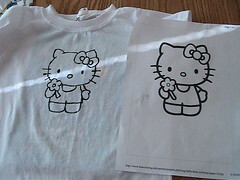 So, I printed out some Hello Kitty coloring pages, put them in the T-shirt and then using regular black fabric paint, I traced the design. 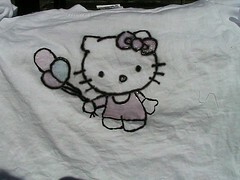 Then, I took the color changing paints and filled in various parts of the t-shirts. I'm a little disappointed with how light the color change is, but reading their website, it says that the paint needs to be applied thickly, so maybe I didn't put it on thick enough and need another coat. When we were at the beach earlier this month, we collected sea shells. Most of the shells we found were really tiny and a number of them broke on the way home. My daughter saw bottles with sand and sea shells in at the souvenir shops but thought they were too expensive. So, I offered to make her one. 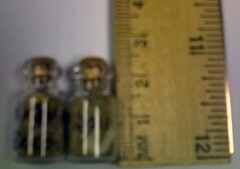 Due to not having a whole lot of seashells and not being able to find any good sized bottles I opted to use some mini ones. I then labeled the jar with the name of the beach and the year. One of the last years that I went to camp as a camper (and not a counselor/aid), our leader told us one of the Tajar tales about an animal that is part tiger, part jaguar, and part badger. In the story she told, his tail came off and he used tape, string and a pin to fasten it back on with. Then, we each received a tajar pin. While I was looking up this story to go with the Tajar pin, I found that other people are actually using tape, string and a pin to make theirs. 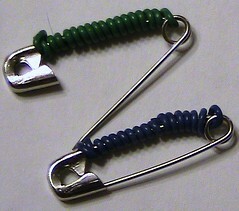 Ours were made by wrapping wire around the closed side of a safety pin. I'm sure she explained the symbolism behind it, but that was a long time ago. I've still got my pin though! They're popping up everywhere. I saw them on my cup from a fast food restaurant, I see them in ads, on the cover of my phone book, even on signs at the zoo and a concert. What are they? QRCodes! I haven't done too much with QR Codes until this round of The Iron Craft Challenge. But the inner geek in me, was intrigued. It turns out that to allow a lot of devices to read these codes, there is a lot of redundancy and error checking built in. What does that mean? It means that some people have started to exploit that by doing custom QR Codes that incorporate an image, or a style to help convey their message. So I decided to give it a try. I started with QRStuff.com and generated a QR Code that just has text (it turns out there are different types of information that a QR Code can contain, in addition to just URLs). 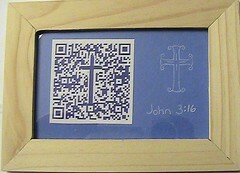 This code has the text of John 3:16. Due to the redundancy in the codes, you can change them some without breaking them for most QR Readers. Now, the software tester in me kicks in here and wants to point out that they're no longer up to the 'spec' for a QR Code so it's very possible that there are readers out there that will not scan them correctly. But what's the fun in that? Now that I've got the code, what should I do with it? Next time, I'll try to paint the wood first that will hopefully make it more distinguishable and will keep the ink from soaking into the wood so much. So, I was back to what to do with the code after I made it. I originally was going to try to print it on shrink plastic but wasn't sure it would still be scanable afterwards. So I thought I'd try it. I tried to print on a small piece of shrink plastic I had left from another project. Fail again! My printer jammed LOL. By this point I had a number of the codes printed out in various sizes, so I decided to just frame one. I've got a smaller version that I printed out that I'll probably attach to the wood with modge podge to make necklace. Can you think of other creative uses for QR Codes? Actually, no I'm not "here", I'm on vacation, but I left after the challenge was posted, so I was able to complete it before I left! This week we were to craft with a map. Recently, when my husband and I were planning our vacation we were talking about all the states that we've visited and that our girls have visited. We decided we should start keeping track. So for this week's challenge, I made a map of the US and colored in the states that my daughter has been to. First, I found a simple map of the US via Google images. I printed it out to the size I wanted it to be (mine was half a sheet of paper). 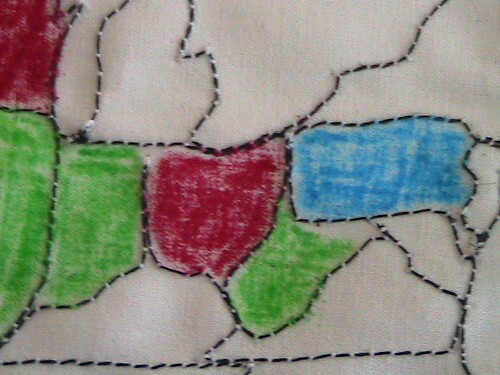 The map I picked had a boarder around the edge, so with the paper on top of the fabric, I sewed the border. This helped to keep the paper from sliding around later. 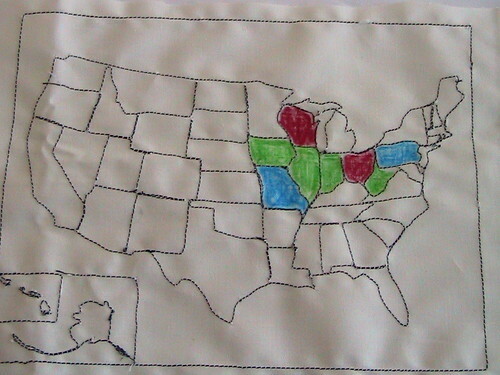 Then, I very slowly just sewed around each state until they were all done. I messed up Maryland a bit as you might be able to tell, I might go back and fix that. After all the states were outlined, I very carefully tore away the paper. I used regular old white printer paper this time, but I'm thinking next time I might use something a little lighter, like onion skin or tracing paper. When I was tearing it away, some of the stitches pulled out. Lastly, I took a non-washable crayon and colored in the states she's been to.